Powers/Abilities: Superhuman strength and durability. Initially anger seemed to trigger this strength, as well as a physiological change, but later it seemed he could initiate his transformation at will. History: (Mystic Comics #5, g.a.) Dr.John Storm was a scientist working late one night in his lab, accompanied only by his dog, Rex. When a rogue ape broke in, Rex's face became skull-like, and he defended his master, ripping out the primate's throat, then falling down dead. Dr.Storm deduced that some sort of chemical reaction had caused the change in appearance and the superstrength displayed. He examined Rex' corpse, trying to isolate the chemicals involved in the hope of using it on a human subject. Soon he had a chemical of reddish fluid which he believed was the substance he wanted. Outside an electrical storm had broken out, and on a nearby road a driver was startled by a lightning bolt striking a tree next to his car, causing him to crash. The man inside, dressed in evening attire, stumbled free and spotting the lab, set off in search of help. He collapsed on the scientist's doorstep, where Dr.Storm found him. Realising the man had lost his memory, Dr.Storm decided that since the man had no past, then he, Dr.Storm, could provide him with a future. Then he strapped his hapless visitor down, and proceeded to inject him with the fluid he had discovered. Seconds after he did so, a gang of ruthless criminals burst in, planning to force the scientist to work for them. When he refused, they proceeded to beat Storm up. Meanwhile the chemicals flowed through the veins of the amnesiac, and as his anger grew as he witnessed the beating, a strange change overtook him. Strange vapour surrounded him, he grew about a foot, and his skin whitened while his face thinned and became skeletal. On seeing this, the thugs fled, with one of them crying out "that guy's a terror!" The stranger gave chase, soon catching up with and killing them. He returned to the lab, to witness Storm pass away, dubbing him "The Terror" with his dying words. After burying the scientist, The Terror vowed to use his new powes to fight crime. (Mystic Comics #6, g.a.) The Terror fought Decker, a Nazi spy who planned to attack the President using a weapon that fired a liquid which shrunk it's victims. (Mystic Comics #7, g.a.) In Midvale, the Terror battled a gang of looters led by Potoro. (Mystic Comics #8, g.a.) Having rescued prisoners from a Nazi slave ship, the Terror travelled to North Africa to stop the Germans using other prisoners to build a railroad across a desert. (Mystic Comics #9, g.a.) 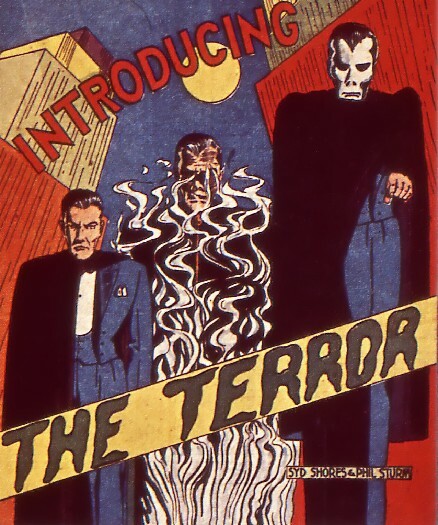 The Terror took on Poison, Inc, a group who committed murders for hire, and tracked down their leader, the Old One. (Mystic Comics #10, g.a.) In Centerville, the Terror faced the Mysterious Mister Z and his Deadly Murder Machine. (She-Hulk #15-17, BTS) The Terror's powers apparently wore off after about a year. (She-Hulk #15-17) Years later the Terror had become a wheelchair-bound old man, and moved into a retirement home, the Mystic Meadows Home for the Elderly. He had believed that his serum had worn off long ago, but when he sensed evil (a greedy executive), he was happily surprised to discover this was not the case, as his power kicked in, returning him to vitality. He accompanied a cosmic being known as the Critic, who took him to another dimension where he fought alongside the She-Hulk against Dr.Angst and his allies, in particular Sitting Bullseye. By the end of this fight everyone else was returned to the Earth, but the fate of the Terror remains unrevealed. Comments: Created by Syd Shores and Phil Sturm.